Happens all the time in the hood. If it's murder the killer would get prosecuted. If it was self defense the shooter will go free. 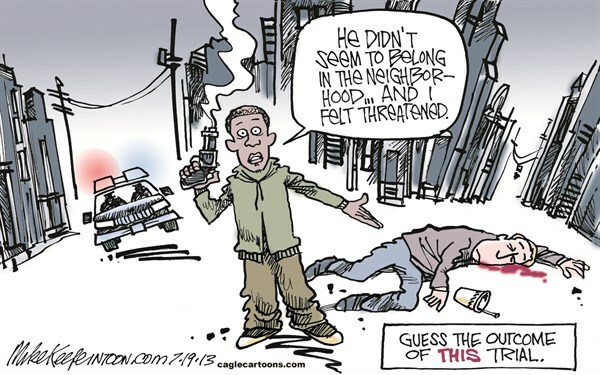 Just like Zimmerman. That's the way our justice system works. Not perfect, but more just than just about anywhere else on earth. it is obvious you are a troll. I've been on this site longer than you. I know a troll post when I see one. You've trolled me on a couple of threads. Pleas go away if you have nothing to contribute. you are a moron go hang out on the democratic party chat boards. Sad story, but it has nothing to do with stand-your-ground. Do you understand what SYG is? Yeah, I was just mocking bensdad. He's had an "epiphany" and thinks that SYG is responsible for all gun homicides. Got it. Sorry, sometime I'm slow to catch humor. Drug deal, just sayin'... with an illegal weapon. That'd be my guess. I agree but bensdad seems to think that syg is behind all gun deaths. Unless, of course, he only cares about black youths being shot when it can be used to advance his racial/political agenda. But that would be a terrible thing to do. Some are under the impression that establishment America is not compassionate; that they are not tolerant enough. Others believe that never ending tolerance will indefinitely permit the sale of that which incites the cynic as justly profitable. But I worry just the same. Over 40 people are murdered per day in this country. Your cartoons are becoming more insulting by the day. who are they insulting ? you? alec, nra, koch, norquist, mcconnel, boehner, rand paul, paul ryan , darryl issa ? None of the things you listed. Do YOU find them insulting because you are not bright enough to understand them? The MSM is geared towards the brain of a 6th grader. We all understand them just fine.